From The New Criterion. January 31, 2016. 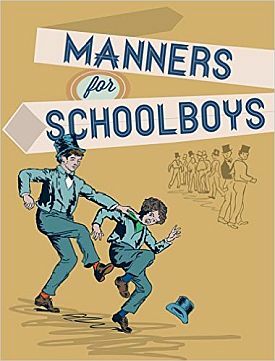 Last year, the British Library published a compact volume called Manners for Schoolboys. It was a repackaging of A manual of manners; or, hints for the proper deportment of school boys published in 1829 by an obscure schoolmaster named J. Robinson and appears to have been intended as a joke, since it is described on the cover as being "packed with frank and funny observations on boys at work and play" — not a description which would have been recognized by J. Robinson. Robbie Millen, reviewing it for The Times, classed it among those "historical curios" which the BL will occasionally "republish as classy lavatory books," though he allows that, in its own time, "it helped, for good or ill, to cement an idea of what an Englishman ought to be." Obviously, neither he nor the publishers would dream of claiming any such thing for a book on manners today — possibly because they regard manners themselves as out of date. Lots of people do, in practice if not in theory. One of the many legacies of revolutionary Marxism to the progressive left and, through it, to the popular culture, is the belief that manners are a bourgeois relic that have no place in a world which prizes personal authenticity above all. And even a cursory browse of Robinson’s Manners will confirm that, among its other, less politically charged purposes, is instruction in the kind of behavior meant to distinguish middle class boys (obviously, a whole different set of instructions would have been required for girls) from those less favored by "Providence" — though "if Providence has placed you in a condition above some other boys," writes the author ("Behavior in the Different Relations of Life" III.1), "this circumstance should not excite pride in you, but gratitude." It would be monstrous, no doubt, if it weren’t so funny. Yet I wonder if we are as remote from standards of mannerly behavior and the sorts of social exclusions they were invented to establish as the British Library can hardly be alone in thinking we are. We may not have any time for J. Robinson’s old-fashioned precepts, but we have others that serve a not dissimilar purpose, even though you might not know it from experience of a media culture ever more disinclined in political discourse to mince words. It is as a result of not doing so, for example, that our old friend Dana Milbank of The Washington Post, a man who appears never to have known a non-partisan moment, says he is able to proclaim with apodictic certainty that "Donald Trump is a bigot and a racist." Mind you, this was well before the rest of the media and all but the whole political world joined in chorus with him over the suggestion by Mr Trump of a prophylactic moratorium on Muslim immigration. Mr Milbank should have left his righteous indignation more room to grow, as with that outrage he could raise the level only to the point of naming and shaming the celebrity billionaire as "America’s modern Mussolini." Come on, Dana, why not go for the whole Hitler? Could it be because the absurdity of the comparison would then have been apparent even to him? The real atrocity, it seemed to me, lay in the death of irony, once thought by some to be Mr Milbank’s forte, which lay silent and lifeless in a corner as the entire media world engaged in the nearest thing I ever hope to see to Orwell’s "two minutes hate" directed at one man — ostensibly on account of his "hate." Nor was the hate for that hate limited to the American media. In Britain, they promoted an on-line petition to bar Mr Trump from entering that country — because, remember, he had proposed temporarily barring a class of people from entering this country. Leaving aside for a moment any substantive consideration of the man’s socially or politically repugnant qualities, is it not a matter of some remark that there appears to be no one in public life objecting to the basic discourtesy of such language, even if you think it true, even if Mr Trump himself can hardly be said to be a model of good manners? J. Robinson would say that you should always speak to your equals respectfully, "Yet if any of them should be cross, still do you be civil, the churlishness of another will disgrace him; while your good nature will gain you love and esteem" (ibid. II.3). Sounds like good advice to me, I confess, even if few anymore can be got to take it. It also reminds us that mincing words, when they are hateful and hurtful words, words intended to exclude people from decent or honorable society, is what decent and honorable society itself depends on, along with the political culture that was originally and for a long time afterward based on it. That culture’s decline into the permanent state of rhetorical guerrilla warfare which we now enjoy has proceeded pari passu with our progressive abandonment of the old standard of good manners for one of invincible but highly personal "truth." J. Robinson, it’s true, affirms ("Deportment in Company," II.22) that "Truth is the basis of every virtue" and that "Every deviation from truth, however trifling, is criminal," but he also wisely enjoins upon his Truth-loving schoolboy (ibid., II.10) to "Be not magisterial in your dictates, or dogmatical in your assertions: contend not pertinaciously in common discourse for your opinion, nor even for a truth of small consequence" — an updating, perhaps, of William Horman’s 16th century maxim that "It does no good for all truth to be told nor all wrong imputed" — itself an updating of the Old English Durham Proverbs and thus the product of a thousand years of folk wisdom for which Mr Milbank, among others, has no further use. Robinson also sagely notes (II.43) that: "The conversation of all persons is not equally elegant and engaging; yet it would be exceedingly rude not to listen to an individual whose qualifications are not of the first rate in this respect, and by a marked inattention to tell him in language sufficiently plain, that you think him a blockhead and not worth the hearing." At some level, even Mr Milbank must approve such precepts, as when he writes: "Ordinarily, I would agree that name-calling is part of what’s wrong with our politics." But the Trumpian rudeness which has prompted his own must be a result of precisely the same self-granted permission to ignore the "ordinarily" applied standards of polite behavior when the provocation is great enough — which in practice means whenever you like. Those who admire Mr Trump do so because he, too, does not mince words. He says what he thinks — and very often what they think — and be damned to those blockheads who take a different view of the truth. They are not fit for decent company. But where do you suppose this creature of the media, this new-minted celebrity politician, learned that such anathematization of those we disagree with, and their relegation to the class of the vulgar and uncouth, is now a normal part of American political discourse? Mr Trump might have taken Mr Milbank’s correspondence course in political vitriol, though he has not yet acquired the master’s finesse along with his malice. Of course, it is unfair to single either man out in this regard. Bad manners are too deeply ingrained in our political culture to be any one person’s responsibility, though the media collectively bear more of it than anyone, since they led the charge half a century ago against what they called "a culture of deference to authority" — in the name of Truth. "Truth" is always the plea of the ill-mannered against censure, but it is amazing how often Truth is lost sight of in the stampede to reach her. For example, on the same op ed page where Mr Milbank’s column appeared, Ruth Marcus was unable to refrain from attributing blame for the actions of a a clearly deranged person who murdered three people in Colorado to "Republican politicians" attempting to deny taxpayer funding to Planned Parenthood. A similar argument was made by Katha Pollitt in The New York Times and others on the left, though the truth in this case was, at a minimum, less than perspicuous to anyone who does not share their political beliefs. But why should that stop a media-approved moralist, who has herself no doubt been accused of complicity in the murder of the unborn, from hurling the charge back at her accusers? Is anyone who does not already believe such things going to be persuaded by these arguments? And, if not, how can they be called arguments — that is, attempts to persuade by reason — at all? Persuadeo, as my Latin teacher used to point out, means "make sweet to," which is why it takes the dative. Not a lot of sweetness, then, to be found on the op ed pages of the Post, or any other paper nowadays. Highly ordinarily occurring "name-calling" is not just "part of what’s wrong with our politics," it’s practically all that is left of our politics, as the so-called candidates’ "debates" in the runup to next year’s presidential election have amply demonstrated. Yet the media, for what I’m very much afraid appear to be self-interested reasons, remain blind to the fact. Name-calling makes for bigger audiences and ad revenues than anything as boring as a real debate. Who else gains from insulting people only for the sake of insulting them? It is, as J. Robinson says (ibid. II.20) of swearing, "a vice which has no temptation to plead; it affords no gratification, and is as vulgar as it is wicked." 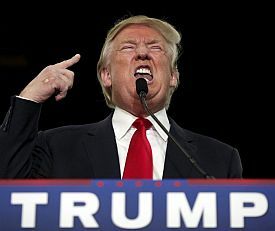 Like swearing too, it has no purpose except to raise the temperature of discourse, or as a form of negative virtue-signaling by dissociating oneself from someone already in political disfavor with the respectable — someone like Donald Trump. Thus Ross Douthat, the conservative columnist for The New York Times, anticipated Mr Milbank’s Mussolini comparison by asking, well before the Muslim exclusion proposal, "Is Donald Trump a fascist?" — and answering (with no less an authority than Umberto Eco to back him up) that, yeah, he pretty much is, though it’s probably best not to say so too often. Signore Eco to the contrary notwithstanding, I think the idea is preposterous. There are no more Fascists, any more than there are Whigs or bimetallists or Dixiecrats, though you wouldn’t know it to hear the modern Democratic party characterized in certain quarters of the right as continuous with that of 1860 or 1924 or 1954. There are as there will always be a certain number of people who believe one or more of the things the Fascists believed, when they existed (1922-1943) as a serious political force, but Fascism as a political movement and therefore as a bugbear to frighten anyone but the ignorant is as dead as imperial preference — or, for that matter, classical liberalism.The absurdity of the comparison is shown by the fondness in other quarters on the right for labeling Islamist terrorists "Fascists" or, even more absurdly, "Islamofascists." Any label that can be applied both to Donald Trump and to Abu Bakr al-Baghdadi can’t be of much use as a label. Yet behind this all-purpose but essentially meaningless pejorative there lies a kind of weird, inverted mannerliness, as there does behind all sorts of political correctness. The fundamental principle of good manners is to avoid giving offense to those to whom respect is owed — namely one’s own community of equals. But in taking up the cause of those supposed to have been excluded from such equality, the politically correct at Yale, Princeton, the University of Missouri and elsewhere in recent months have turned manners on their head. Instead of disciplining themselves to avoid giving offense to others, they attempt to discipline others to cease giving offense to themselves. Today’s schoolchildren do not learn rules of deportment from those in authority over them but instead seek to instruct their teachers in how to behave. J. Robinson could have told them that this cannot end well. "It is better a chylde unborne than untaught," as William Horman wrote. As in so many other ways, attacks on authority can only be made by appeal to some other authority, invariably more demanding than that which is under attack. The parody of politeness in "trigger-warnings" and "safe spaces" and "cultural appropriation" has in common with real politeness, however, the aim of creating class solidarity, uniting those who know how to behave (and believe) properly against those who do not. And, as always, the media take a prominent part in promoting anything beneficial to a ruling class likely to employ them in the essential task of excluding from it those they may identify, as Donald Trump has been identified, as political riff-raff. The media’s quickness to blame pro-lifers for the Colorado murders contrasted interestingly with their agonizing slowness to apply the word "terrorism" to the mass murders of San Bernardino a few days later. In a headline bound to be long remembered as summing up the wilful blindness of the respectable American media under President Obama, The Washington Post’s front page report two days after the killings there read: "Motive elusive in deadly San Bernardino rampage as FBI takes over probe." Likewise, the only news arising out of the President’s own address to the nation a few days later was that he had at last condescended to call it — along with the Ft. Hood shootings and other terrorist events: "terrorism." Yet on that occasion, he also gave the impression that he believed, and expected his audience to believe, that any "discrimination" against Muslims as a result of terrorism was a greater threat to the Republic than terrorism itself. Here, too, there must be a kind of mannerly reticence in the wish not to offend law-abiding and pacific Muslims, through association of their religion with terrorism, but it seems odd to single them out for such solicitude in a rhetorical context where charges of lying, bigotry and even murder against whose with whom we disagree politically have become almost routine. Shortly before Mr Milbank delivered his heavy judgment against Mr Trump, his Washington Post colleague Chris Cillizza wrote a piece alleging that "Donald Trump is leading an increasingly fact-free 2016 campaign." Once again, let’s leave aside subsequent discoveries of evidence that what Mr Cillizza called Mr Trump’s "complete flouting of fact" in speaking of celebrations among the Muslim population of New Jersey after the events of 9/11, also remarked on by Mr Douthat, was a good deal less than complete. Instead, let’s agree with him that "If there is no agreed-upon neutral arbiter, there are no facts" and that what he calls "the obsession" of Mr Trump and others "with disqualifying the ability of the media to referee what is factual and what is not is a terrible thing for the future of our democracy." But who does he suppose is responsible for that disqualification? It wasn’t Donald Trump who created the public’s massive distrust of an increasingly partisan media. Mr Cillizza’s piece itself, along with that of the Post’s "Fact Checker" Glenn Kessler on the same subject is a good example of media attempts to exclude Mr Trump or anyone like him from political legitimacy. Knowing this, he deliberately flouts the media’s "rules" and lots of people, people who trust the media less than they trust Mr Trump, cheer him for it. Can it really be that the media have no idea why this should be the case? As well ask if they can really have no idea whether or not the Farook-Malik couple in California were terrorists. "No matter your political affiliation or how negatively you view the media," writes Mr Cillizza, "think of Trump and this campaign more generally as the leading edge of what politics could look like if fact checkers and the media suddenly disappeared. 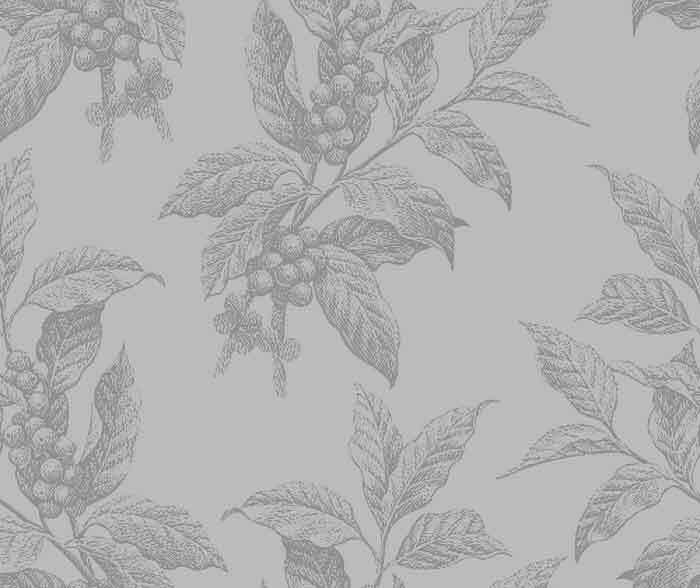 Not too pretty, right?" But it’s what politics looks like now — with all the fact checkers and the media firmly in place. Maybe they’re part of the problem, rather than part of the solution, though it never seems to occur to Mr Cillizza that such might be the case. A little more respect and consideration for those with whom he disagrees might, as J. Robinson could have told him, have opened his eyes to otherwise unsuspected Truths.